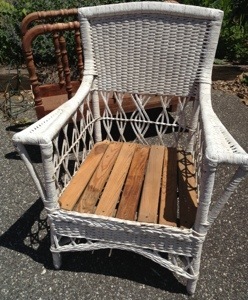 Look at what we did…..this has been created from something else or repurposed…. 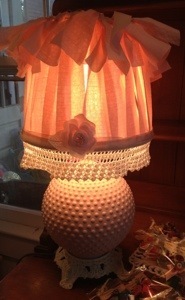 This sweet milk glass lamp has been transformed. Antoinette is the soft pink paint on the milk glass, Old White is painted on the metal base. 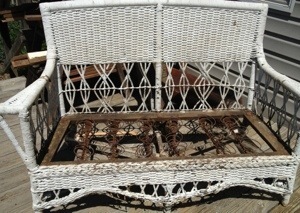 A metal shade frame is covered with strips of pastel fabric, trimmed with hand crocheted lace and a sweet pink flower. 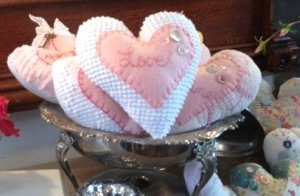 Very girly, very sweet. 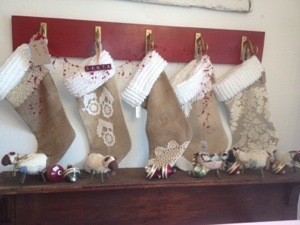 We have created stockings from burlap, chenille spreads, linens, lace and doilies. We are all decked out and ready for Shoppers. After being mauled by people at the malls and big box stores pop into your local shops and spread some holiday love…we are thinking if you…don’t forget us…thanks! 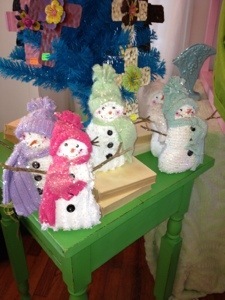 We are so excited about the snowmen that arrived here on Saturday. Would give a warm home to a cool snowman? 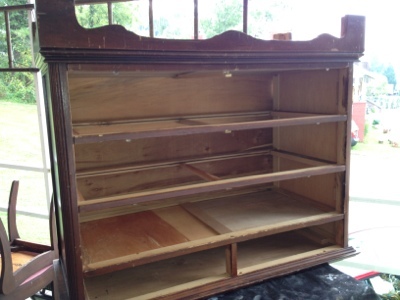 I get a lot of questions about what to do before painting a piece of furniture. Here is what we do at The Pink House to get ready. 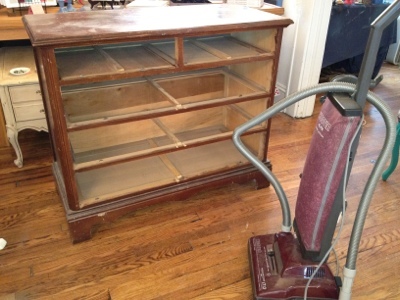 Because our furniture is for sale we want to make sure it is free of mold or mildew and that there are no dust bunnies or spiders living in the furniture – we do a good cleaning. After vacuuming and using bleach water we are ready to start. We want to make sure there is no old furniture polish laying on the piece. Usually the bleach water is able to do that. 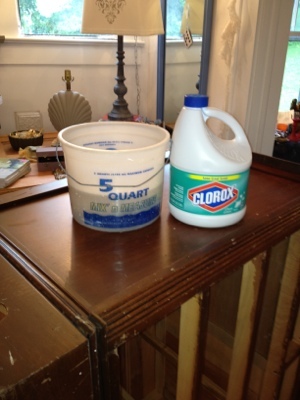 You could also use ammonia if you prefer that cleaning agent. 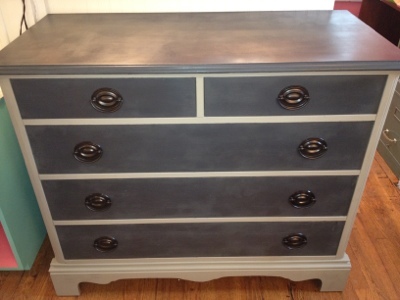 No sanding or priming is required when using Annie Sloan Chalk Paint (TM). 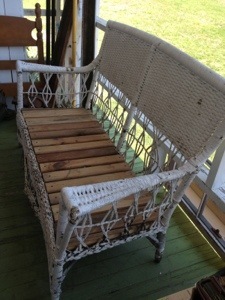 Sanding is only recommended when the surface has peeling finish or possibly deep scratches in the wood. 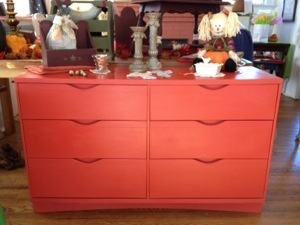 Occasionally we come across a piece of furniture that has polish or a stain finish that “bleeds” through paint. We never anticipate this but if we spot a pink cast coming through the paint, we stop painting, allow that paint to dry and then coat the piece with Zinser Clear Shellac. After that dries you are good to go….paint on. When we start a project we usually turn over and start from the bottom and work our way to the top, turn over and finish the piece. Here is a picture of this completed project. 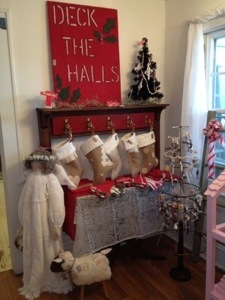 Recently one our Pink House customers shared with us some of her talents. 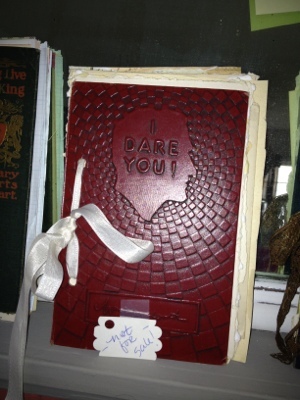 We sat down and created beautiful journals. 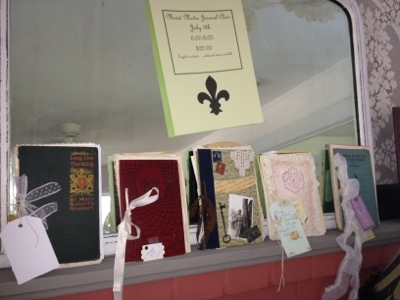 My sister made one to use on an upcoming mission trip to Alaska and I put together a lovely wedding journal that includes memorabilia from a 1904 wedding in Weaverville, NC. We have put together kits for you to make your own. Our first class will be on Mondau, July 9 from 6-8. Won’t you join us?